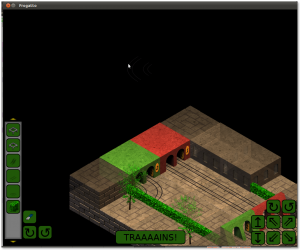 Over the past half-year or so, I’ve made a game using the Frogatto engine called Cube Trains. It’s a 3D puzzle game based around building tracks in the confines of the city. You can visit the website over here: http://ddr0.github.com. A picture is worth a thousand words, they say, and I’m not very talkative. Let’s make this post 2153 words long, shall we? Just a side note, in the 0.2.0 release for windows and linux, you’ll need to remove any Frogatto save-files you have saved from their save folder. Cube Trains expects there to be none there when it starts up the first time, though you can rename the save-files and put them back when you’re done. (save.cfg -> save1.cfg, save1.cfg -> save2.cfg, and so on) This problem does not affect Mac users. The code is available in the cube_trains module of Frogatto, in the more recent git versions. This entry was posted on Tuesday, May 8th, 2012 at 10:20 am	and is filed under Uncategorized. You can follow any responses to this entry through the RSS 2.0 feed. Responses are currently closed, but you can trackback from your own site. Wow. 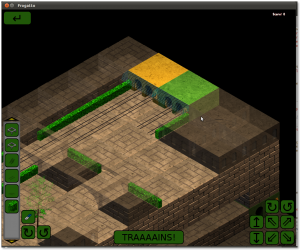 I had no idea that isometric graphics like that were possible in Frogatto. Surprisingly, it took about four lines of code to set up the 3D effect. In many ways, Frogatto is a wonderful engine to work with.